Chicken has not been one of my strong desires to serve. I guess because I’ve been worn out by others preparing such a tasteless meat. Seems you have to do everything under the sun to make it taste like something else and still call it chicken. 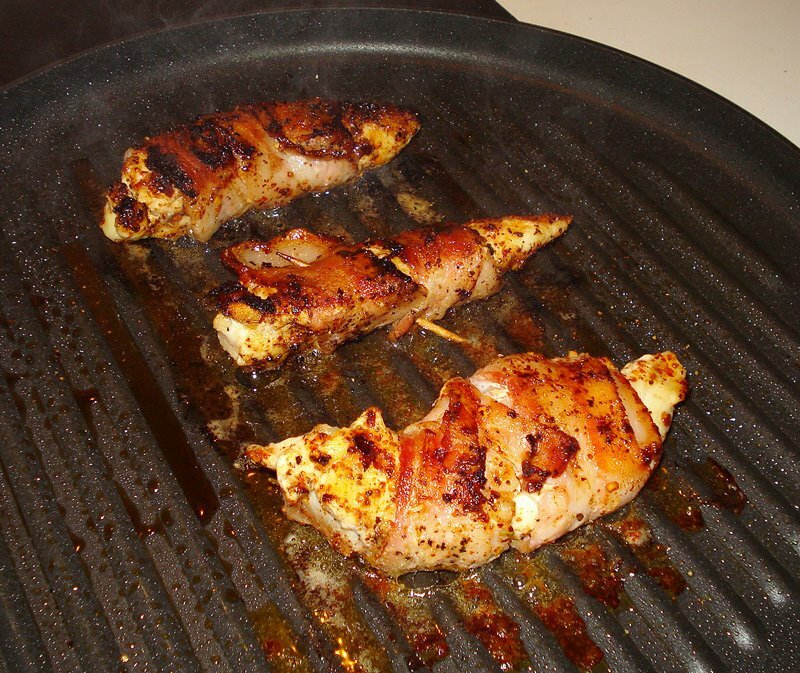 This dish, Bacon-wrapped Chicken Tenderlions was thought up by my oldes son (15) one afternoon. I had bought some chicken tenderlions not knowing what I was actually going to do with them. Only reason for buying them was to serve something different to my kids since I rarely buy chicken these days. Since this meal was my sons idea, I had him the kitchen with me to get them prepared. Very simple, plus it’s nice to get others involved in the kitchen as a family affair. I thawed the chicken out and placed them on a large platter. The pack of chicken I had, gave me nine tenderloins. I seasoned them with a smoked dry seasoning, garlic and black pepper. My son then wrapped the chicken tenderlions with the bacon using a spiral wrap then using toothpicks to hold the bacon in place. If you like to have a nice hot spice to this dish, cut a jalapeno pepper horizontally and place on the chicken then wrap it with bacon. I have one son who isn’t crazy about jalapeno’s I opted to delete them this time around. Using my awesome grilling pan by Calphalon, (a non-stick 12″ round grill pan), I set the temperature at medium-low or medium (4-5 on an electric stoptop). Have a splatter screen ready for this one. Spray your pan with a non-fat cooking spray and place the chicken on the grill pan. Watch it closely so you do not burn your bacon. You want to have a uniform color to your bacon. Why? Because part of serving a delicious dish like this one is to have a nice presentation. Always remember something about ME, food presentation is everything! What looks good, tastes even better! Be nice to your food! This dish only takes about 10-12 minutes to prepare. Since I do deal with picky eaters at times, this evenings meal was complimented by french fries and mozzeralla stuff bread rolls. Dessert? You bet we had dessert. Finished our meal off with old fashion A&W Rootbeer Floats topped with whipped cream. An all-round great outdoor meal brought indoors. I have had friends ask me what type of chicken I buy. Well, not the throw darts at anyone, but I go by look, color and texture of the raw chicken…and yes boneless. I try to stay away from any name brands. I will say, I am absolutely not a Tyson’s chicken fan. Too rubbery and no taste. That is saying alot to an already tasteless white meat. Inexpensive meal and a great way to bring the kids into the kitchen and have fun. It’s always about family and friends.